Old things have character, no doubt. If we are raised right, we respect older folks for their wisdom, spirit, and sense of humor. They have been around the block, so to speak. They have survived troubled times and still manage to smile. Museum collections draw numerous visitors from around the world as they are intrigued by the uniqueness of the items on display. With a combination of a location with historical value, a structure that is quality-built and has a colorful past, and really interesting antique items surrounding the scene, visitors feel history as though they themselves are living it. Smiling Tony Brown is quite a character himself. Brown was shuffling down the sidewalk in front of his family’s downtown Troy historical home at 122 Kootenai Avenue as this reporter pulled up to interview him. A history buff, adventurer, entrepreneur, outdoorsman, amateur photographer, and a great appreciator of the finer things in life, Brown is a very likable guy. So likable in fact, that he was elected Mayor of Troy several times starting back in the 1970’s. Folks gathering for the Old Fashioned Fourth of July celebration would run into the Mayor on the then closed Bar Street enjoying the great musicians, food, and festivities just as much as the other residents and visitors. The nickname Downtown Tony Brown seemed appropriate, and stuck. From the outside, the ancestral home appears well constructed of formidable materials. 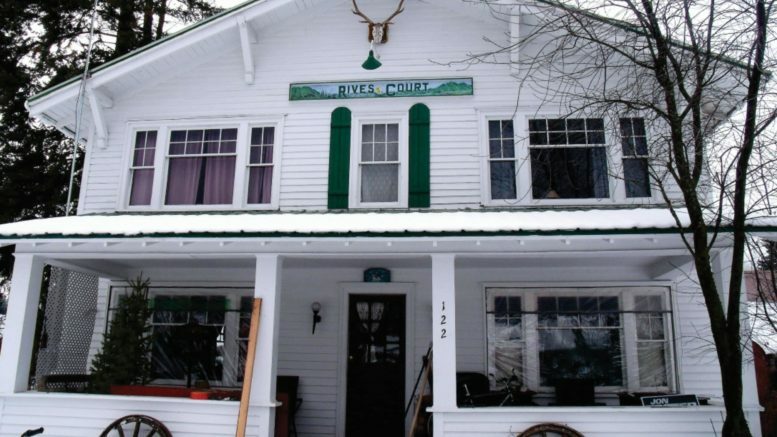 On the flat face of the peaked roof is an old sign that says Rives Court Rooms and Cabins which is framed by a set of elk antlers. Upon entering, an old-fashioned desk bill announces your entrance, and that’s when you begin to feel the history. Brown’s great aunt Lena May Mullins was a civil war refugee from Alabama who came west in a wagon and homesteaded in Washington state. 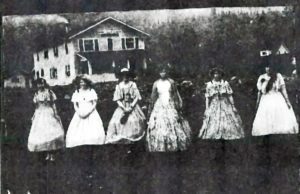 When the railroad began to come through Washington in the late eighteen-hundreds, she was working in the famous Davenport Hotel in Spokane. She worked at a boarding house where railroad executives stayed often. Lena learned the business over time, and being somewhat of an entrepreneur herself, she migrated to Troy with the idea of building her own rooming house. Before the streets were laid out, she apparently hooked up with a fellow named Alabama Rives who had a reputation for being a moonshiner and may have been involved with prostitution. Together, they built the Rives House Railroad Eating and Boarding establishment circa 1920. The place was very modern for its day, and post prohibition Lena had the first state liquor license in the great state of Montana. Brown’s Mom, Betty Mullins Brown was raised by Lena. He was also brought up in the house, and his father built the original Silver Spur. 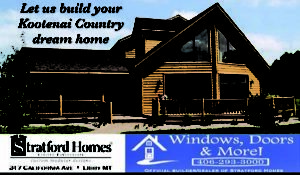 Between and after his many adventures Brown has refurbished the old historic home thoroughly, and as he told The Montanian, “It’s always a work in progress.” In the near future, he hopes to have a tourist destination known as Rives Court and Cabins. 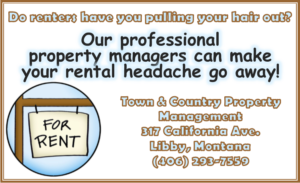 Availability for future rentals can be discussed with Tony by calling him at 295-4285. Brown has always had a lot of faith in the people of Troy and the area in general. 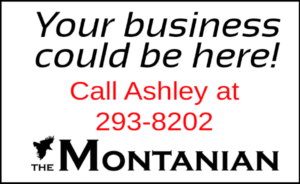 He believes that we have one of the most beautiful little locations in Montana, and that we have great potential for tourism. Brown is hoping that down the road a bit, Rives Court and Cabins may have great potential as an accommodation house and tourist attraction. He just might have something there. One certainly feels the history as they enter the building. And Brown believes the presence of Lena May Mullins still roams the Rives house. Photo of Rives Court front view. Photo by Brian Baxter, The Montanian. Right: Photo Earlier period building photo with 1910 fire damage in background and reported Jezebel’s in foreground. Photo courtesy of Tony Brown.